ALeft click on the valve model to open its settings. 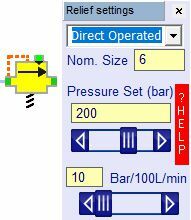 Select the relief valve type from the drop-down list box. A direct operated valve will have no external leakage but the pilot version will. The symbol will show which one is being used. The set pressure is the valve cracking pressure at the point when the valve starts to open in bar. The bar/100L/min is the valve's pressure rise rate. This is the rate at which the pressure increases with increasing flow. Look at the component data sheet for the valve you are be using and there should be a graph from which you can estimate the appropriate value. There is currently no hysteresis or valve dynamics included. Pressure reducing valves are set up in exactly the same way as pressure relief valves. The name of the valve is shown in the data window title and just below the main menu bar.